The initial coin offering (ICO) train is moving full steam ahead. This train has been building steam for awhile starting with Bitcoin. Bitcoin tested out the use of cryptographically distributed ledgers at a global level. From the bitcoin test, we are now seeing all kinds of different tokens being issued out on crypto ledgers. Along this train ride we are seeing controversies from individuals, issuers, and regulators of what the coins actually are. Are they pre-sales, hybrids, or equities? One of the first coins to arrive prior to bitcoin was the “ShutterStock” type of credit or coin. The ShutterStock credit is very easy to understand. It’s an exchange of currency for a credit which can be used to purchase a product. We see this when purchasing a picture on ShutterStock.com. If you make a purchase of $29 dollars to ShutterStock, they in turn give you 2 image credits which can be used to buy a picture. This can be seen as a pre-product buy. A credit is bought in order to purchase a product in the future which is common in crowdfunding or todays ICO’s with their whitepaper. The second type of coin is the “Beanie Baby”. Beanie Babies are a hybrid of pre-product release coins with the ability to have some intrinsic value unrelated to ownership in the company. If done correctly, the Beanie Babies price is driven by the actual product and actual value that is created outside of the product value. Typical ways of creating this intrinsic value is through premium services that the ecosystem provides to it’s members. An example of this is seen with decentralizing the network and members setup a server to do some type of mining or validation to get paid. Keep in mind, the intrinsic value can be all hype which can be a form of value. 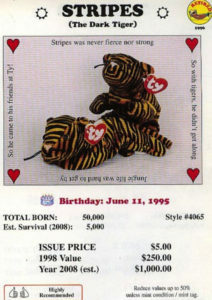 An example can be seen with the Beanie Babies on eBay as below picture shows. The third and final coin is the Equity coin or “Crypto Equity”. The equity coin is actual ownership in a business which passes the Howey Test. An example of this type of issue is seen with Blockchain Capital. The token is crowdfunded and filed as a Reg D Rule 506c with the SEC which is an unregistered security. This is a very new concept because it allows transparency and an auditable recording of all ownership with the ability to transmit easily to another party. A more general term is the “Crypto Asset” or “Crypto Security” which can represent other security assets such as debt. Typically, these types of coins are regulated by the SEC and FINRA. With all the ICO hype, the coins will be one of the above three categories. The coins all start at an initial price and go from there. A ShutterStock coin starts at $1 and ends at $1. A Beanie Baby coin starts at $1, and depending on supply or demand can increase or decrease in value. The final coin, Crypto Equity is related to ownership in the company which can go up or down in price just like a publicly traded stock. We are in a new financial paradigm. Information contained herein is for informational purposes only and should not be construed as an offer, solicitation, or recommendation to buy or sell securities, or personalized investment, tax or legal advice. The information has been obtained from sources believed to be reliable; however no guarantee is made or implied with respect to its accuracy, timeliness, or completeness. Authors may own the stocks they discuss. The information and content are subject to change without notice. TreveriCapital LLC is a California registered investment advisor. Securities offered through Rainmaker Securities, LLC – a registered broker dealer, Member FINRA/SIPC. 11390 W. Olympic Blvd, Suite 380, Los Angeles, CA 90064. Investment opportunities listed with Rainmaker Securities, LLC involve a high degree of risk, and are only suitable for “accredited investors” as defined by the U.S. Securities and Exchange Commission. All investors are encouraged to seek legal and other professional counsel prior to making any investments.